Save money when you purchase the publications as a bundle. Contemporary Nephrology Nursing is an excellent resource for all nurses caring for patients with kidney disease. It is meant to serve as an adjunct to ANNA’s Core Curriculum for Nephrology Nursing by providing more in-depth information. This edition includes an update of all current chapters with evidence-based data and the addition of 28 completely new chapters, covering the full breadth of nephrology nursing practice. Three exciting new sections deal with nursing management of comorbidities and complications, cultural safety, health literacy, psychosocial issues in nephrology nursing, and regenerative medicine and innovations. Each chapter offers self-assessment questions and continuing nursing education (CNE) credit opportunities (CNE processing fees apply). Contemporary Nephrology Nursing 3rd Edition, 2017, 1,072 pages. Stand-alone member price $125, regular price $175. ANNA’s Core Curriculum for Nephrology Nursing presents the newest information regarding kidney disease, its treatment, and the nursing care involved. Designed to provide information for the novice as well as the experienced health professional, this edition provides information not published in previous editions. Each module offers self-assessment questions and continuing nursing education (CNE) credit opportunities (CNE processing fees apply). 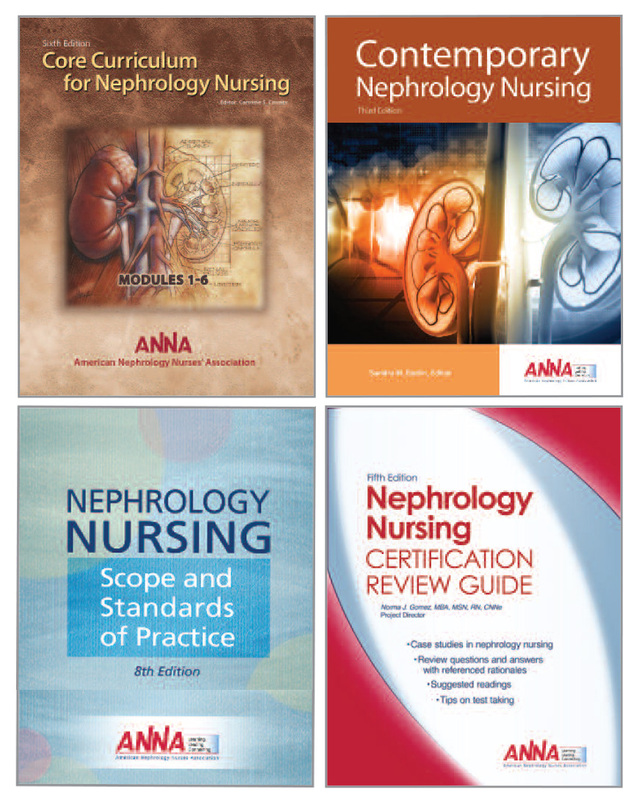 Core Curriculum for Nephrology Nursing, 6th edition, 2015 (Complete Set 6 modules), 1,576 pages. Stand-alone member price $115, regular price $160. Nephrology Nursing Scope and Standards of Practice provides a method of defining the scope of nephrology nursing practice and a conduit for evaluating that practice. This resource serves as a guide in identifying nephrology nurses’ responsibilities to their profession, their colleagues, and the healthcare consumer. Nephrology Nursing Scope and Standards of Practice, 8th Edition, 2017, 120 pages. Stand-alone member price $40, regular price $60. expanded edition also includes a section for advanced practice nurses that focuses on pharmacology and diagnosis. This resource can be used in conjunction with other primary sources such as the Core Curriculum for Nephrology Nursing and Contemporary Nephrology Nursing as a study guide for the nephrology nursing certification exams. Nephrology Nursing Certification Review Guide, 5th Edition, 2017, 64 pages. Save money when you purchase the Nephrology Nursing Essential Bundle. Member price: The essential bundle price for members is $250 – a savings of $70 off the individual publication prices. Regular price: The regular price of the essential bundle is $350 – a savings of $105 off the individual publication prices.